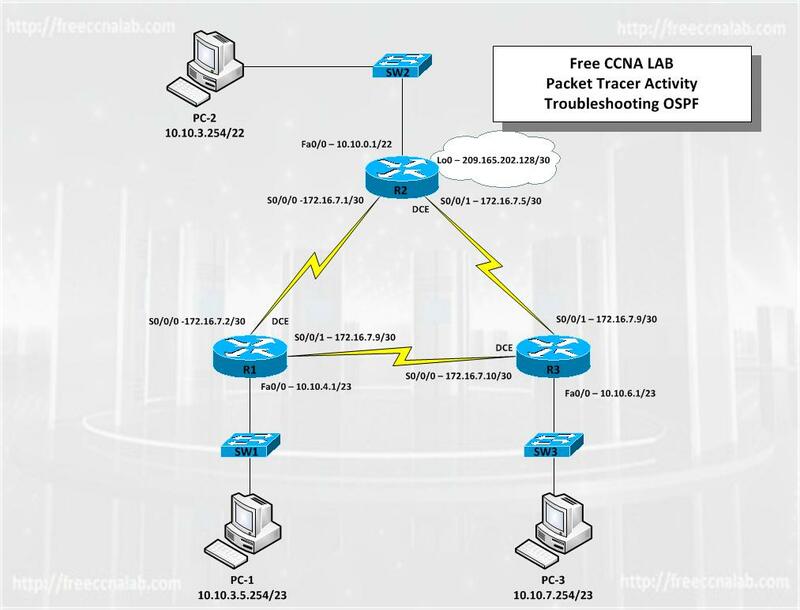 In this free CCNA lab, you will troubleshoot an OSPF configuration. The routers and PCs have already been loaded running configuration. These configurations contain errors that will prevent end-to-end communication across the network. You will need to troubleshoot each router to determine the configuration errors, and then use the appropriate commands to correct the configurations. When you have corrected all of the configuration errors, all of the hosts on the network should be able to communicate with each other. OSPF routing is configured on the BR1 router. OSPF routing is configured on the BR2 router. OSPF routing is configured on the HQ router. OSPF updates must be disabled on the LAN and Loopback interfaces. The HQ router must redistribute the default route to the Loopback interface in the routing updates. All OSPF routers must use a process ID of 1. All OSPF routers must be in area 0. Discover where communication is not possible. Gather information about the misconfigured portion of the network along with any other errors. Analyze information to determine why communication is not possible. Propose solutions to network errors. Implement solutions to network errors. Does anyone have the solution for this lab?